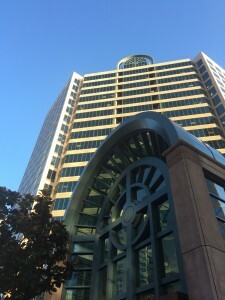 Klinedinst’s San Diego office at 501 W Broadway. The downtown Klinedinst office is located steps from the Hall of Justice, the Edward J. Schwartz U.S. Courthouse, and the Carter/Keep United States Courthouse, and the new San Diego Central Courthouse (currently under construction). The San Diego location is also blocks away from popular local destinations, including Seaport Village, Convention Center, Gaslamp Quarter, and Horton Plaza. Airport and freeway access is also convenient, since the office is within a mile of Interstate 5. Due to its proximity to the border, the San Diego office is often called upon to service our international clientele, including those from México and Latin America.